Scheme 10.21 • Metabolic activation of capecitabine to 5-FU. of ribose, and the only difference in structure is the epimeric hydroxyl group at the 2'-position of the pentose sugar. This epimeric sugar is similar enough to the natural ribose to allow ara-C to be incorporated into DNA, and its mechanism of action may include a slowing of the DNA chain elongation reaction via DNA polymerase or cellular inefficiencies in DNA processing or repair after incorporation. Gemcitabine59 is the result of fluorination of the 2'-position of the sugar moiety. Gemcitabine is the 2',2'-difluoro deoxycytidine species and after its anabolism to diphosphate and triphosphate metabolites, it inhibits ribonucleotide re-ductase and competes with 2'-deoxycytidine triphosphate for incorporation into DNA. The mechanism of action for gemcitabine is likely similar to that of ara-C including alteration of the rate of incorporation into DNA as well as the rate of DNA processing and repair. Modification of the pyrimidine ring has also been explored for the development of potential anticancer drugs based on antimetabolite theory. Several pyrimidine nucleo-side analogs have one more or one less nitrogen in the hete-rocyclic ring. They are known as azapyrimidine or deaza-pyrimidine nucleosides. 5-Azacytidine is an example of a drug in this category (see Fig. 10.8). 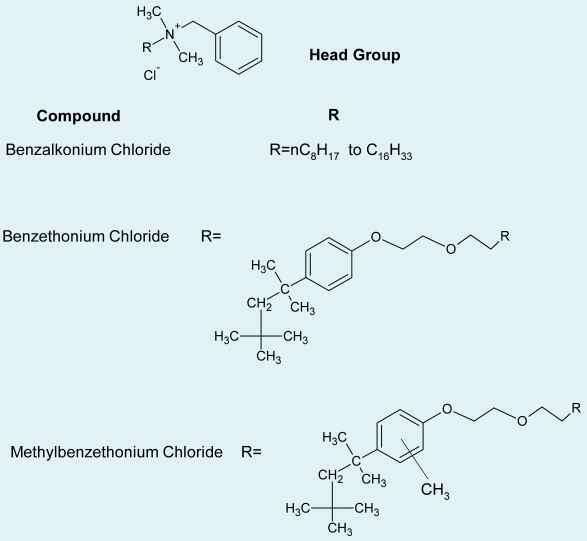 This compound was developed via organic synthesis and later found as a natural product of fungal metabolism. The mode of action of this compound is complex involving reversible inhibition of DNA methyltransferase, and this lack of methylated DNA activates tumor suppressor genes. In certain tumor systems, it is incorporated into nucleic acids, which may result in misreading or processing errors. The anticancer drugs based on purine structure are shown in Figure 10.9. 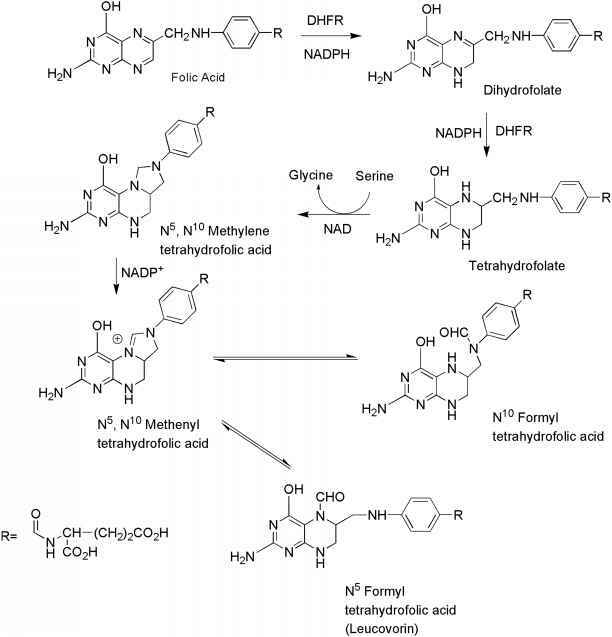 The design of antimetabolites based on purine structure began with isosteric thiol/sulfhydryl group to replace the 6-hydroxyl group of hypoxanthine and guanine. One of the early successes was 6-mercaptopurine (6-MP), the thiol analog of hypoxanthine.60 This purine requires bioactivation to its ribonucleotide, 6-thioinosinate (6-MPMP), by the enzyme HGPRT. The resulting nucleotide (Scheme 10.22) is a potent inhibitor of an early step in basic purine biosynthesis, the conversion of 5-phos-phoribosylpyrophosphate into 5-phosphoribosylamine (see Scheme 10.16). The ribose diphosphate and triphosphates of 6-mercaptopurine are active enzyme inhibitors, and the triphosphate can be incorporated into DNA and RNA to inhibit chain elongation.61 However, the major antineoplastic action of 6-MP appears to be related to the inhibition of purine biosynthesis. Figure 10.9 • Anticancer drugs based on purines and related compounds. Scheme 10.22 • Conversion of 6-MP to active 6-thioinosine-5-monophosphate (6-MPMP) by HPGRT and inactivation by xanthine oxidase and thiopurine methyl transferase. 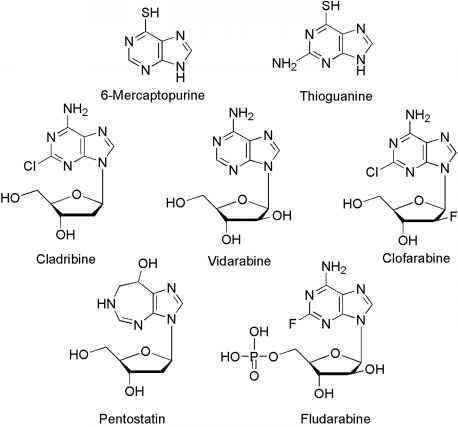 The antineoplastic activity of these purines as well as most antimetabolites depends on the relative rates of enzymatic activation and inactivation of these compounds in various tissues and cells. Drug resistance in certain cell lines may be caused by lower activity of activating enzymes or higher activity of catabolic enzymes.64 For the classic purine antimetabolites 6-MP major pathways of inactivation (see Scheme 10.22) include S-methylation via thiopurine-S-methyl-transferase (TPMT) and oxidation by the enzyme xanthine oxidase (XO).62 Xanthine oxidase converts the drugs to the inactive thiouric acid, and inhibition of the enzymes responsible for the catabolic breakdown of the purine drugs can potentiate the drug's antineoplastic activity. Allopurinol is a potent inhibitor of xanthine oxidase and is often used as an adjuvant in purine anticancer drug therapy. Allopurinol increases both the potency and the toxicity of 6-mercaptopurine. Its main importance is that it prevents the uric acid kidney toxicity caused by the release of purines from destroyed cancer cells. Heterocyclic derivatives of 6-mercaptopurine, such as azathioprine, were designed to protect it from catabolic reactions. Although azathioprine has antitumor activity, it is not significantly better than 6-mercaptopurine. It has an important role, however, as an immunosuppressive agent in organ transplants. Adenine arabinoside (Vidarabine) contains the sugar, D-arabinose, which is epimeric with D-ribose at the 2'-position. This structural change makes it a competitive inhibitor of DNA polymerase, and this activity accounts for its antineoplastic activity as well as its antiviral action. Adenine arabinoside and some of its derivatives are limited in their antitumor effect by susceptibility to adeno-sine deaminase. This enzyme converts them into the inactive hypoxanthine arabinoside derivatives. High levels of adeno-sine deaminase accounts for resistance of certain tumors to the action of adenine arabinoside. The addition of fluorine to the sugar moiety has produced some purine-based drugs with resistance to the catabolic activity of adenosine deaminase. In contrast to the susceptibility of adenosine arabinoside to adenosine deaminase, its 2-fluoro derivative, fludarabine, is stable to this enzyme. The antineoplastic activity of fludarabine depends on its anabolic conversion to the corresponding triphosphate. 2-Chloro-2'-deoxyadenosine (cladribine) also is resistant to adenosine deaminase. It is phosphorylated in cells to the triphosphate by cytidine kinase, and the triphosphate inhibits enzymes required for DNA repair. Folic acid and the structures of the major antifolate anticancer drugs are shown in Figure 10.10. 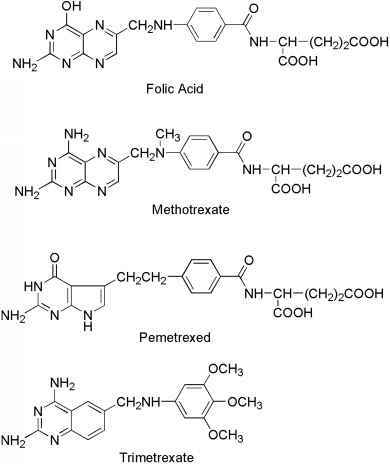 Methotrexate is the classic antimetabolite of folic acid structurally derived by N-methylation of the para-aminobenzoic acid residue (PABA) and replacement of a pteridine hydroxyl by the bioisosteric amino group. The conversion of —OH to —NH2 increases the basicity of N-3 and yields greater enzyme affinity. This drug competitively inhibits the binding of the substrate folic acid to the enzyme DHFR, resulting in reductions in the synthesis of nucleic acid bases, perhaps most importantly, the conversion of uridylate to thymidylate as catalyzed by thymidylate synthetase.65 In addition, purine synthesis is inhibited because the N-10-formyl tetrahydrofolic acid is a formyl donor involved in purine synthesis. The interconversion of the various folate species is shown in Scheme 10.23. Recall that in Scheme 10.16, THFs are cofactors in at least two key steps in the normal biosynthesis of purines. Methotrexate66 is a broad-spectrum antineoplastic agent commonly used in the treatment of acute lymphoblastic and myeloblastic leukemia and other lymphomas and sarcomas. The major side effects seen are bone marrow suppression, pulmonary fibrosis, and GI ulceration. Leucovorin is often given 6 to 24 hours after methotrexate to prevent the long-term effects on normal cells by preventing the inhibition of DNA synthesis. Related to this is Pemetrexed, but its scope is greater in that it not only inhibits DHFR but also TS and glycinamide ribonucleotide formyltransferase (GARFT), which is involved in purine biosynthesis (see Fig. 10.16). The material is taken into tumor cells by the reduced folate-carrier systems and subsequently converted to the polyglu-tamate, which is retained in the cell. colorectal cancer, stomach cancer, pancreatic cancer, and topical use in basal cell cancer of the skin. The mechanism of action includes inhibition of the enzyme TS by the deoxyri-bose monophosphate metabolite, 5-FdUMP. The triphosphate metabolite is incorporated into DNA and the ribose triphosphate into RNA. These incorporations into growing chains result in inhibition of synthesis and function of DNA and RNA. Resistance can occur as a result of increased expression of TS, decreased levels of reduced folate substrate 5,10-methylenetetrahydrofolate, or increased levels of dihy-dropyrimidine dehydrogenase. Dihydropyrimidine dehydro-genase is the main enzyme responsible for 5-FU catabolism. 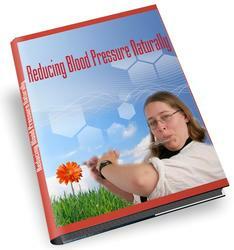 Bioavailability following oral absorption is erratic. Administration of 5-FU by IV yields high drug concentrations in bone marrow and liver. The drug does distribute into the central nervous system (CNS). Significant drug interactions include enhanced toxicity and antitumor activity of 5-FU following pretreatment with leucovorin. Toxicities include dose-limiting myelosuppression, mucositis, diarrhea, and hand-foot syndrome (numbness, pain, erythema, dry-ness, rash, swelling, increased pigmentation, nail changes, pruritus of the hands and feet). Figure 10.10 • Structures of folic acid and antifolate anticancer drugs. tivity to hydrolyze the carbamate moiety and deamination. Capecitabine is readily absorbed by the GI tract, and peak plasma levels of 5-FU occur about 2 hours after oral administration. Indications, drug interactions, and toxicities are equivalent to those of 5-FU. The drug is available in 100-, 500-, 1,000-, and 2,000-mg multidose vials for IV use. Cytarabine is used in the treatment of acute myelogenous leukemia and CML. This drug is a deoxycytidine analog originally isolated from the sponge Cryptothethya crypta. It is active following intracellular activation to the nucleotide metabolite ara-CTP. The resulting ara-CTP is incorporated into DNA resulting in chain termination and inhibition of DNA synthesis and function. Resistance can occur because of decreased activation or transport and increased catabolic breakdown. Metabolic breakdown within the GI tract leads to poor bioavailability. The drug distributes rapidly into tissues and total body water with cerebrospinal fluid (CSF) levels reaching 20% to 40% of those in plasma. Cytidine deami-nase is the primary catabolic enzyme involved in the inacti-vation of cytarabine. Drug interactions include antagonism of the effects of gentamicin, decreasing the oral bioavail-ability of digoxin, as well as enhancing the cytotoxicity of various alkylating agents, cisplatin, and ionizing radiation. Pretreatment with methotrexate enhances the formation of ara-CTP metabolites resulting in enhanced cytotoxicity. Toxicities include myelosuppression, leukopenia and thrombocytopenia, nausea and vomiting anorexia, diarrhea, and mucositis. Neurotoxicity is usually expressed as ataxia, lethargy, and confusion. An allergic reaction often described in pediatric patients includes fever, myalgia, malaise, bone pain, skin rash, conjunctivitis, and chest pain. The drug is available as a 500-mg vial of lyophilized powder. The drug is used to treat metastatic GI adenocarcinoma. The mechanism of action of this fluoropyrimidine deoxynu-cleoside analog involves metabolic conversion to 5-fluo-rouracil (5-FU) metabolites resulting in inhibition of TS thus disrupting DNA synthesis, function, and repair. Resistance can occur because of increased expression of TS, decreased levels of reduced folate 5,10-methylenetetrahy-drofolate, increased activity of DNA repair enzymes, and increased expression of dihydropyrimidine dehydrogenase (the major catabolic enzyme). The drug is poorly absorbed from the GI tract and is extensive metabolized to 5-FU and 5-FU metabolites. Dihydropyrimidine dehydrogenase is the main enzyme responsible for 5-FU catabolism, and it is present in liver, GI mucosa, white blood cells, and kidney. The drug interaction and toxicity profiles are equivalent to those of 5-FU. The drug is available as the hydrochloride salt in 200- and 1,000-mg lyophilized single-dose vials for IV use. Gemcitabine is used to treat bladder cancer, breast cancer, pancreatic cancer, and NSCLC. Gemcitabine is a potent ra-diosensitizer, and it increases the cytotoxicity of cisplatin. The mechanism of action of this fluorine-substituted deoxy-cytidine analog involves inhibition of DNA synthesis and function via DNA chain termination. The triphosphate metabolite is incorporated into DNA inhibiting several DNA polymerases and incorporated into RNA inhibiting proper function of mRNA. Resistance can occur because of decreased expression of the activation enzyme deoxycyti-dine kinase or decreased drug transport as well as increased expression of catabolic enzymes. Drug oral bioavailability is low because of deamination within the GI tract, and the drug does not cross the blood-brain barrier. Metabolism by deamination to 2', 2'-difluorouridine (dFdU) is extensive. Drug toxicity includes myelosuppression, fever, malaise, chills, headache, myalgias, nausea, and vomiting. The drug is available in a 10-mg or 10-mL single-use vial for IV use. Cladribine is used for chronic lymphocytic leukemia, hairy cell leukemia, and non-Hodgkin's lymphoma. The mechanism of action of this purine de-oxyadenosine analog involves incorporation into DNA resulting in inhibition of DNA chain extension and inhibition of DNA synthesis and function. This incorporation into DNA occurs via the triphosphate metabolite active species. The 2-chloro group on the adenine ring produces resistance to breakdown by adenosine deaminase. Resistance to the anticancer effects can occur because of decreased expression of the activating enzyme or overexpression of the catabolic enzymes. Oral bioavailability is variable and averages about 50%. The drug crosses the blood-brain barrier; however, CSF concentrations reach only 25% of those in plasma. The drug is selectively activated inside the cell, and intracellular concentrations of phosphorylated metabolites exceed those in plasma. Toxicities include myelosuppression, neutrope-nia, immunosuppression, fever, nausea, and vomiting. The drug is available as the phosphate salt in a 50-mg vial for IV use. Fludarabine is used to treat chronic lymphocytic leukemia and non-Hodgkin's lymphoma. The mechanism of action involves the triphosphate metabolite and its inhibition of DNA chain elongation. The 2-fluoro group on the adenine ring renders fludarabine resistant to breakdown by adenosine deaminase. The drug is rapidly dephosphorylated to 2-fluoro-ara-adenosine (F-ara-A) after administration. F-ara-A is taken into the cell and subsequently re-phosphory-lated to yield the triphosphate (F-ara-ATP), the active drug species. Resistance can occur via decreased expression of the activating enzymes and decreased drug transport. Fludarabine is orally bioavailable and is distributed throughout the body reaching high levels in liver, kidney, and spleen. The drug is metabolized to F-ara-A, which enters cells via the nucleoside transport system and is rephospho-rylated by deoxycytidine kinase to fludarabine monophosphate and finally fludarabine triphosphate, the active species. About 25% of F-ara-A is excreted unchanged in urine. Drug interactions include an increased incidence of fatal pulmonary toxicity when fludarabine is used in combination with pentostatin. Additionally, fludarabine may potentiate the effects of several other anticancer drugs including cytarabine, cyclophosphamide, and cisplatin. Toxicities include myelosuppression, immunosuppression, fever, nausea, and vomiting. The drug is available as a 50-mg tablet for oral use. The primary uses of mercaptopurine are in the treatment of lym-phoblastic leukemia, acute lymphocytic leukemia, and Crohn disease. The mechanism of action includes incorporation of mercaptopurine into DNA and RNA via the triphosphate metabolite. This incorporation inhibits synthesis and function of the resulting modified DNA or RNA. The parent drug is inactive and requires phosphorylation for activity. Resistance can occur via decreased expression of the activating enzymes or increased expression of the major catabolic enzymes. Oral absorption is generally incomplete (about 50%) and the drug does not enter the CNS in therapeutic quantities. Mercaptopurine is metabolized by methylation, and the methylated product has anticancer activity. Oxidation by xanthine oxidase yields inactive metabolites. The concurrent use of xanthine oxidase inhibitors such as allopurinol can enhance the potency of mercaptopurine by inhibiting its cata-bolic breakdown. The toxicities for mercaptopurine include myelosuppression, immunosuppression, nausea, vomiting, diarrhea, dry skin, urticaria, and photosensitivity. The drug is available in 40-mg tablets for oral use. Thioguanine is used to treat acute nonlymphocytic leukemia. The mechanism of action involves incorporation of the triphosphate into DNA and RNA, resulting in inhibition of processing and function. Intracellular phosphorylation is required for activity and inhibition of purine biosynthesis. Resistance can include decreased expression of the activating enzyme, decreased drug transport, and/or increased expression of catabolic enzymes. The oral absorption of thioguanine is poor, and the drug does not appear to cross the blood-brain barrier. Major metabolic pathways involve deamination or methylation. Thioguanine is not a substrate for the enzyme xanthine oxidase in contrast to mercaptopu-rine. Toxicities include myelosuppression, immunosuppres-sion, nausea, vomiting, mucositis, and diarrhea. The drug is available in 10-mg vials for IV use. The drug is used to treat leukemias such as hairy cell leukemia, chronic lymphocytic leukemia, and lymphoblastic leukemia. The mechanism of action involves inhibition of the enzyme adenosine deaminase yielding increased cellular levels of deoxyadenosine and deoxyadenosine triphosphate (dATP). The increased levels of dATP are cytotoxic to lymphocytes. Pentostatin is a fermentation product of Streptomyces an-tibioticus. Resistance appears to involve decreased cellular transport or increased expression of catabolic enzymes. Acid instability prevents oral administration, and the drug is only administered by IV. The drug is distributed in total body water but does not enter the CNS. The majority of the dosage is excreted unchanged in the urine. Fatal pulmonary toxicity has occurred when pentostatin and fludarabine are used in combination. Toxicities include myelosuppression, immunosuppression, nausea, vomiting, headache, lethargy, and fatigue. The drug is available in 50-, 100-, 200-, and 1,000-mg vials for IV use. Methotrexate is used to treat several cancer types including breast cancer, bladder cancer, colorectal cancer, and head and neck cancer. The mechanism of action of methotrexate involves inhibition of DHFR leading to a depletion of critical reduced folates. The reduced folates are necessary for biosynthesis of several purines and pyrim-idines. Resistance to methotrexate can occur because of decreased carrier-mediated transport of drug into cells or increased expression of the target enzyme DHFR. Oral bioavailability varies with dose because of saturable uptake processes, and high doses are required to reach therapeutic levels in the CNS. The majority of drug dosage is excreted unchanged in the urine. The renal excretion of methotrexate is inhibited by several carboxylic acid drugs such as penicillins, probenecid, nonsteroidal anti-inflammatory agents, and aspirin. Methotrexate enhances 5-FU antitumor effects when given 24 hours prior to the fluoropyrimidine. Methotrexate toxicity includes myelosuppression, mucosi-tis, nausea, vomiting, severe headaches, renal toxicity, acute cerebral dysfunction, skin rash, and hyperpigmentation. The drug is available in a 100-mg sterile vial for IV use. The drug appears to be effective against a range of tumors including mesothelioma, NSCLC, colorectal cancer, bladder cancer, and lung cancer. The mechanism of action involves inhibition of TS resulting in inhibition of thymidylate and DNA synthesis. This drug is a pyrrolopyrimidine analog of folate with antifolate activity. Resistance can occur by increased expression of TS, decreased binding affinity for TS, or decreased drug transport into cells. The drug is administered only via the IV route and distributes to all tissues. Cellular activation to the more potent polyglutamated forms occurs, and the majority of the dose is excreted unchanged in the urine. The drug interaction and toxicity profiles are similar to that of methotrexate. The drug is available as a lyophilized powder in 5- or 30-mg vials for IV use. The drug is used to treat colorectal cancer, head and neck cancer as well as NSCLC. The mechanism of action of trimetrexate involves folate antagonism and inhibition of thymidylate synthesis. Trimetrexate does not form intracellular polyglutamate adducts as does methotrexate and other related compounds. Resistance can occur by increased expression of the target enzyme, decreased binding affinity for the target enzyme, or decreased intracellular drug transport. Trimetrexate is administered only by the IV route and distributed throughout the body with extensive binding to plasma proteins. The major catabolic pathways involve O-demethylation followed by glucuronide conjugation. The drug interaction and toxicity profiles are similar to those for methotrexate. HONH-CO-NH2. The drug is available in a 500-mg capsule for oral use. Hydroxyurea is often considered an an-timetabolite drug, and it is used to treat myelogenous leukemia, ovarian cancer, and essential thrombocytosis. The mechanism of action of hydroxyurea involves inhibition of DNA biosynthesis by inhibition of the enzyme ribonu-cleotide reductase (see Fig. 10.15). Resistance can occur via increased expression of ribonucleotide reductase. The oral bioavailability is quite high approaching 100% and the drug is distributed to all tissues. Hydroxyurea readily enters the CNS and distributes to human breast milk. A major portion of the total dose is excreted unchanged in the urine. The drug has been shown to increase the toxicity of 5-FU, and hydroxyurea may increase the effectiveness of some antimetabolite HIV drugs. The toxicity profile includes myelo-suppression, leucopenia, nausea, vomiting, pruritus hyper-pigmentation, headache, drowsiness, and confusion.